University of Arizona Press, 9780816515660, 364pp. Our national parks are more than mere recreational destinations. They are repositories of the nation's biological diversity and contain some of the last ecosystem remnants needed as standards to set reasonable goals for sustainable development throughout the land. Nevertheless, public pressure for recreation has largely precluded adequate research and resource monitoring in national parks, and ignorance of ecosystem structure and function in parks has led to costly mistakes--such as predator control and fire suppression--that continue to threaten parks today. 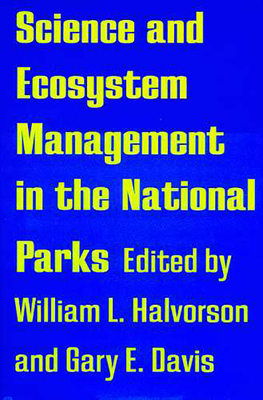 This volume demonstrates the value of ecological knowledge in protecting parks and shows how modest investments in knowledge of park ecosystems can pay handsome dividends. Science and Ecosystem Management in the National Parks presents twelve case studies of long-term research conducted in and around national parks that address major natural resource issues. These cases demonstrate how the use of longer time scales strongly influence our understanding of ecosystems and how interpretations of short-term patterns in nature often change when viewed in the context of long-term data sets. Most importantly, they show conclusively that scientific research significantly reduces uncertainty and improves resource management decisions. Chosen by scientists and senior park managers, the cases offer a broad range of topics, including: air quality at Grand Canyon; interaction between moose and wolf populations on Isle Royale; control of exotic species in Hawaiian parks; simulation of natural fire in the parks of the Sierra Nevada; and the impact of urban expansion on Saguaro National Monument. Because national parks are increasingly beset with conflicting views of their management, the need for knowledge of park ecosystems becomes even more critical--not only for the parks themselves, but for what they can tell us about survival in the rest of our world. This book demonstrates to policymakers and managers that decisions based on knowledge of ecosystems are more enduring and cost effective than decisions derived from uninformed consensus. It also provides scientists with models for designing research to meet threats to our most precious natural resources. "If we can learn to save the parks," observe Halvorson and Davis, "perhaps we can learn to save the world." William Halvorson is a research ecologist with the with the U.S. Geological Survey’s Southwest Biological Science Center at the Sonoran Desert Research Station. He is also a faculty member at the School of Natural Resources and Environment at The University of Arizona. Gary E. Davis is a research marine biologist with the National Biological Service working at Channel Islands National Park in California.